Why Do People Decide to Fly Solo? Nowadays, it is easy to witness university students eating, drinking, and even talking alone. In other words, doing something ‘alone’ is now a widespread culture. According to the Ministry of Public Administration and Security, singleperson households have increased from 6.87 million to 7.45 million since 2014. More particularly, a famous parttime job portal, “Part-time Heaven”, has announced their findings which indicated that 78.3 percent of people in their twenties found doing things by themselves is more comfortable. 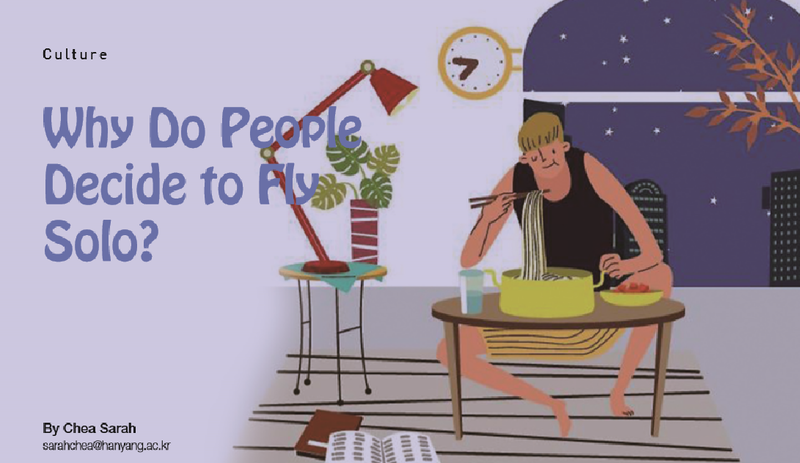 If so, why are so many people “flying solo”? This cultural phenomenon should no longer be treated as a trend, but should rather be critically analyzed in order to determine its true value. The term, ‘Relationship-Diet’, is a combination of the words “relationship” and “diet”. It indicates the action of purposely cutting off personal relationships. Many people choose to do this because of the stress that comes by having to maintain such a wide network of relationships. Unemployment is still a huge issue in South Korea as many university students are trying to spend as much time as they can to build better qualifications. In such a process, competition is an inevitable factor. The constant advice that comes from people close to us and the empty promises we make with people who are better off than us, might fill our time but have emptied our hearts. Last July, a South Korean television program Non Summit held a discussion under the topic of personal relationships in their 159th episode. Aancod Abe Zaccarelli, the English representative, talked about his experience on ‘resetting relationships’. He was 19 when he had attempted to cut off all his personal relationships. He explained that it was the competition that brought him to do such an action. “When I was 19, everyone was telling me things I needed to do like getting a good job and earning money. No one cared about my happiness. I am sure that they never intended to offend me in any way, but everyone around me was advising me on how to be a good competitor and not a good person,” said Aancod. He explained that he was angry, lonely, and confused because he felt obliged to follow their advice, even when he knew that it was not for him. “I had this obsession about figuring out who I was, and as I kept thinking, I slowly fell into depression,” he added. Is Society Really to Blame? It has been academically proven that society and culture can co-exist; the only difference that they have is that society is composed of people while culture is composed of thoughts that these people have. Therefore, it is safe to say that there are certain social reasons behind this cultural trend. Then, is competition really the reason why people are choosing to distance themselves from others? Could there be other social components that have helped this trend develop? The author of the book, Organizing Relationships is the Power, and CEO of ‘Very Good Professional Organizers᾿, Yoon Sun-hyun, explained about other reasons for this cultural trend, “In our contemporary society, people have a wide variety of preferences. Therefore, it is very hard to meet someone who has similar viewpoints. Instead of adapting their thoughts to accommodate others, they choose to cut off relationships entirely and live by themselves.” He pointed out the stubborn act of focusing on one’s own values is an obstacle that we need to overcome. People nowadays are serious skeptics when they try to communicate with others and their skepticism shows through a newly coined term ‘Tissue Relationship’. A ‘Tissue Relationship’ is a combination of the words ‘tissue’ and ‘relationship’, meaning a one-time relationship that people look to have for their own particular benefit. Nowadays, more people are looking for ways to cut off personal relationships that they deem unworthy of their attention and many apps have appeared to help such process. Individualistic lifestyles are not only showing through apps, but have seeped deeply into our daily lives as well. While walking along the street, we can now easily see restaurants and cafes that only cater for customers who have come alone, while small karaoke rooms are popular because people can go inside and sing by themselves. Every action that was, in the past, deemed as a group activity is slowly changing into individualistic activities.